Dr. Pat C. Hodgell earned her doctorate at the University of Minnesota, and is a graduate of both Clarion and the Milford Writers Workshop. 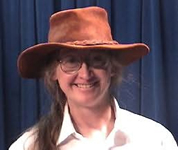 Recently retired, she was a lecturer at the University of Wisconsin-Oshkosh in modern literature and composition, and teaches an audio-cassette-based course on science fiction and fantasy for the University of Minnesota. She now lives in Oshkosh, Wisconsin. In addition to writing and teaching, she attends SF conventions, collects yarn, knits, embroiders, raises cats, and makes her own Christmas cards. God Stalk was nominated for a Mythopoeic Fantasy Award in 1983. Read excerpts of her novels at P.C. Hodgell’s website. The God Stalker Chronicles (Kencyrath) — (1982-2017) Blood & Ivory is a story collection set in the Kencyrath world. Publisher: Jame, a young woman missing her memories, struggles out of the haunted wastes into Tai-tastigon, the old, corrupt, rich and god-infested city between the mountains and the lost lands of the Kencyrath. Jame’s struggle to regain her strength, her memories, and the resources to travel to join her people, the Kencyrath, drag her into several relationships, earning affection, respect, bitter hatred and, as always, haunting memories of friends and enemies dead in her wake. God Stalk, first in the Kencyrath series authored by P.C. 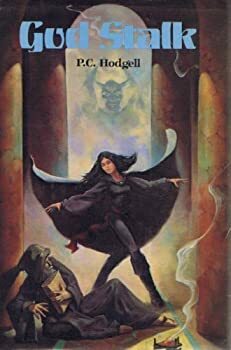 Hodgell in the early 80s, opens with Jame stumbling into Tai-Tastigon, which is apparently deserted, after being so long on the run that she's delirious with exhaustion and fighting off her race's healing dwar sleep. She chances upon Penari, a famous thief, as he's trapped in a doorway by a couple of footpads. Jame rushes to the rescue and Penari offers her a job as recompense. Too weak, confused and lost to comprehend, Jame wanders the maze of Tai-Tastigon until she collapses just inside the doorstep of the Res a'Bytrr, one of the few taverns open on the eve of the Feast of the Dead Gods.